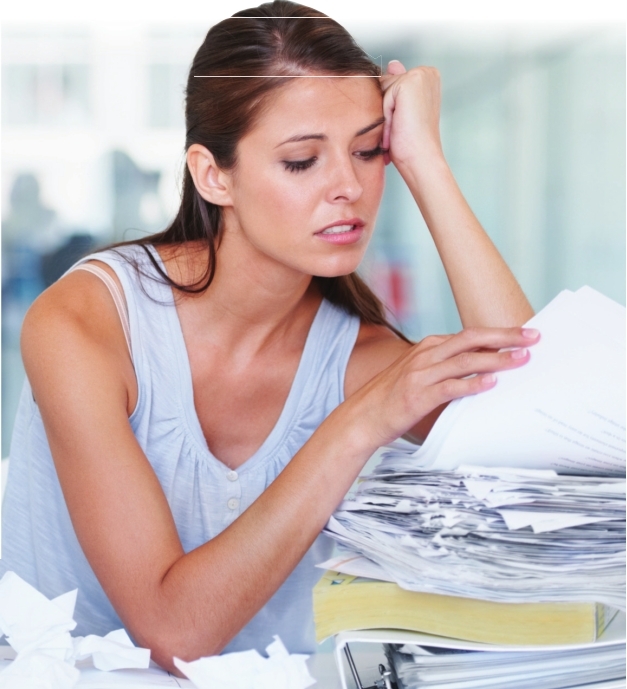 Do you suffer from a paper pile up in your home? Junk mail, old magazines, newspaper clippings, circulars … it’s easy to let it take over your space! Stay tuned for some strategies to rid your home of the paper clutter. Step One Discard! Discard! Discard! Junk mail and catalogs are like door-to-door salespeople. Occasionally you’re interested in what they are selling, but more often than not, you are annoyed at the intrusion. The difference is that you can be as rude as you like to junk mail and catalogs, but they just keep coming. If you have piles of unopened mail offers, solicitations and catalogs, dump them. Don’t even give it a second thought, because you know you’ll always get more. However, for those magazines and catalogues you insist on keeping, buy a beautiful basket or bin to keep next to your bedside or sofa. Just make sure to throw out old issues as new ones arrive. Step Two Designate a box, bin or basket for the balance of the incoming mail. Corral the mail in one spot until you’re ready to deal with it. Step Three Read it and route it. Set up individual baskets or bins for each member of your family. Short on counter space? Plastic wall pockets provide wonderful “off-the counter” storage. Step Four Set up a central command station with a large calendar and bulletin board. A large paper calendar with multiple pages is preferable. This will allow you to make notes on future months and record birthdays in advance. Magnetic bulletin boards are great. Throw out old invitations and paperwork after noting them on the calendar, but if it’s something you want to hang on to, stick it on bulletin board. Step Five Create a simple system for storing bills, such as a folder or envelope labeled “bills to be paid.” When you receive bills, save only the bill and payment envelope. Throw away the outer envelope and advertising inserts to avoid build-up of paper clutter. Step Six Set up a filing system for your important documents. Insurance papers, warranties, titles, tax information, etc. should be stored here. As you file something, flip through the folder to see if something else can be thrown out. Once a year, purge old folders and papers from your filing cabinet. Magazines. We all love to buy them, flip through them, lay them artfully on the coffee table. But what then? We save them, piles and piles of them. We can’t get rid of them. God forbid, we might want that recipe for banana cream pie in the May 1985 issue of Good Housekeeping. So, what do you do? Look up the magazine online. If you can find the article posted on their Web site, add it to your Pinterest board, easily eliminating the paper trail while hanging on to that great idea! Create Pinterest boards for fashion, beauty, health, travel, books and music, food and décor. • Personally, I use a rolling cart with hanging files on the top and wire baskets on the bottom. This allows my papers to roll along with me throughout the house as I clean and straighten up. • There are lots of beautiful file boxes and baskets available these days. Check out Pottery Barn, The Container Store and Target for attractive, functional storage solutions. • The classic metal filing cabinets with files is always a great basic. This sturdy cabinet can handle the load for big filers. • Whether you are a gourmet cook with lots of recipes, or in the stages of building a new home, a binder is a great storage tool. The basic three-ring binder with removable plastic sleeves is my favorite. Your goal should be to be able to put your eyes on the right piece of paper exactly when you need it, rather than shuffling it from pile to pile. Keep your home clutter-free by making a conscious decision to surround yourself with only the things you love and use. If you have questions about organizing your home or designing your dream closet, visit www.melaniejohnsonsclosets.com or call 453-0964. Follow Melanie Johnson on Facebook, Pinterest and Houzz.com for ideas and inspiration!